Welcome to China! Our private English-speaking guide and driver will pick you up in time at the airport and transfer you safely to the hotel. A paper board with the sign your name will be held high at the airport exit. The rest of the day is free at your own leisure. As the capital of China, Beijing is a must-see for tourists; it was also one of the great capitals of ancient China. Our tour today, includes Tiananmen Square, Forbidden City, Temple of Heaven, and Tea House. Tiananmen Square: Where you could see the symbol of China-the majestic Tiananmen Tower. Forbidden City: Nearby Forbidden City, a world reputed palace of Chinese 24 emperors in Ming and Qing dynasties. The Temple of Heaven: A royal temple worshipped by Chinese emperors to pray to heaven for a good harvest. Great Wall sightseeing is very popular among the tourists. Spend the morning in Mutianyu Great Wall; the afternoon in Summer Palace and Cloisonne Factory. Mutianyu Great Wall: One of the most famous sections of the Great Wall but less crowded. The section is well-known for its beautiful surrounding landscapes and the peculiar wall shapes integrated with the steep mountains. Summer Palace: A world reputed royal garden for imperial families’ entertainment; a cruise in its beautiful Kunming Lake is included, drifting you into the imagination of Chinese emperor’s life. In the morning, go to the Olympic Green and pay an exterior visit to the Water Cube and the Bird’s Nest; have Hutong tour with rickshaw, learn to make Chinese dumplings with a local Hutong family. Then leave for the airport and fly to Xian. Be picked up by our guide and driver will pick you up at Xian airport and transferred to the hotel. Olympic Green: The home of Water Cube and Bird’s Nest which rank among the top 10 architectural miracles in China appraised by Business Week. Hutong tour with rickshaw: Pay a visit to the local Hutong family; chat with them, learn to make Chinese dumplings, and of course eat a dumplings lunch. Xian is one of the four major ancient civilization capitals, enjoying the equal fame with Athens, Cairo, and Rome. Today we will visit Terracotta Warriors and Horses, Big Wild Goose Pagoda, Xian City Wall, Xian Art Pottery Factory. The Terra cotta Warriors and Horses: is one of the most significant archeological finds of the 20th century. The ‘underground army’ of 6000 life-size painted terracotta warrior and horses have been protecting the mausoleum of the first emperor in Chinese history- Emperor Qinshihuang for 2,200 years. Xian Art Pottery Factory: Where you could see the copies and souvenirs of Terra cotta Warriors and Horses as well as Tang Tricolor. Big Wild Goose Pagoda: A holy place for Buddhists. Take a tour to the Shaanxi Historical Museum in the morning. After lunch, you will be transferred to airport and takes the flight to Guilin. Upon your arrival, our guide and driver will pick you up at Guilin airport and drive you to the hotel. Shaanxi Historical Museum: The museum is a good-sized national museum built with the architectural features of the Tang Dynasty. The museum houses the best cultural heritage of Shaanxi Province. Guilin, is famed as ‘the finest scenery under heaven’. 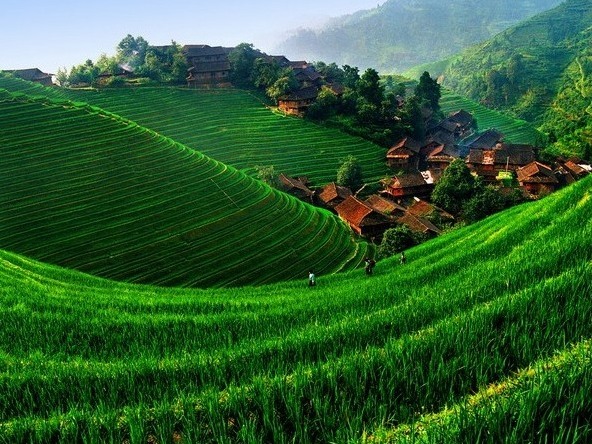 Here you could not only see the marvelous natural sceneries but also experience the pastoral life of the local people; let’s find out that by visiting the Zhuang and Yao Ethnic Tribes, and Longji Terraced Field. Longji Terraced Field: The Terrace is a rice field built on the hillsides, looking like great chains or ribbons as they wind from the foot to the top of the hill. It is created by the minority peoples of the area, such as the Zhuang and Yao Ethnic Tribes. Zhuang and Yao Ethnic Tribes: The architecture of the Zhuang and Yao minority villages is unique as no nails are used in construction. The different minority customs and local people’s dressing style are specially delicate and beautiful. Enjoy a Li River Cruise and do a leisure sightseeing in West Street in Yangshuo Country. Li River Cruise: Li River scenic area is world reputed for its unique natural sceneries with the most beautiful karst mountains, clear water and a taste of life far removed from the concrete metropolis. West Street in Yangshuo Country: Yangshuo is an ancient and beautiful country. Walk around its famous street – West Street. The street is the oldest one in Yangshuo with a history of more than 1,400 years and attracts approximately 100,000 foreigners for its unique mix of cultures. Traditional folk arts, shops, cafes, restaurants and bars are all along the street. In the morning, visit Moon Mountain and Big Banyan Tree in Yangshuo. Leave for Guilin airport and fly to Shanghai. Be met by our guide and driver at Shanghai airport and transferred to the hotel. Moon Mountain: No journey to Yangshuo would be complete without climbing the famous Moon Hill, named for the conspicuous, lunar-shaped cavity in the center. The Big Banyan Tree: The tree is more than 1,000 years old, 17 meters high, covering an area of more than 100 square meters with a green umbrella like round tree crown. We are in Shanghai now, a renowned international metropolis. Feel the distinct city though sightseeing in Yuyuan Garden, Shanghai World Financial Center, Jade Buddha Temple, Silk factory, the Bund and Nanjing Road. Yuyuan Garden: A famous classic garden in Shanghai, The pavilions, halls, rockeries, ponds and cloisters all have unique characteristics. Shanghai World Financial Center: At 1,555 ft high, the top observation deck at the Shanghai World Financial Center is a great stop during your visit of Shanghai. Jade Buddha Temple: A famous old Buddhist temple for the two jade Buddha statues brought from Burma. The Nanjing Road: In the east of the Bund, China’s premier shopping street, 3.4 miles long, a must-see destination attracting thousands of fashion-seeking shoppers from all over the world. Free at your own leisure till your transfer to airport for departure. We wish you have a pleasant journey home and thank you for using our service. * China internal flights: Beijing-Xian, Xian-Guilin, Guilin-Shanghai. It is very annoying that you do not publish your prices. It is also not clear if this is a group tour or a private tour. For group tours there is no excuse for not publishing prices. This is a private tour, please see detailed prices at: http://www.beijingtoursguide.com/chinatoursitinerary/11-day-china-impression-tour.html. Thank you.